In this landmark biography, Jane Addams becomes America's most admired and most hated woman—and wins the Nobel Peace Prize. 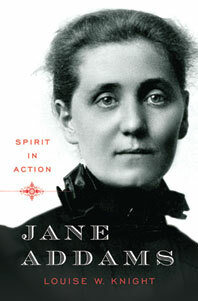 Jane Addams (1860-1935) was a leading statesperson in an era when few imagined such possibilities for women. In this fresh interpretation, the first full biography of Addams in nearly forty years, Louise W. Knight shows Addams's boldness, creativity, and tenacity as she sought ways to put the ideals of democracy into action. Starting in Chicago as a co-founder of the nation's first settlement house, Hull House—a community center where people of all classes and ethnicities could gather—Addams became a grassroots organizer and a partner of trade unionists, women, immigrants, and African Americans seeking social justice. In time she emerged as a progressive political force; an advocate for women's suffrage; an advisor to presidents; a co-founder of civil rights organizations, including the NAACP; and a leader for international peace. Written as a fast-paced narrative, Jane Addams traces how one woman worked with others to make a difference in the world.